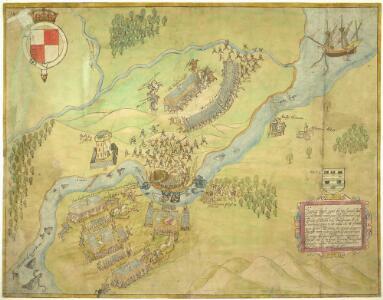 Description: This is a pictorial battle plan showing the defeat of Maguire at Beleek in county Fermanagh on Oct 10th 1594. It shows the protagonists of the battle and names them in script and records the point in the battle when the River Ern was crossed. The rebels’ are depicted as a disorganized hoard and the draughtsman has included such details as discarded bagpipes among their ranks. The Earl of Tyrone, who was very unwillingly present at the battle is shown ridding beside Sir Henry Bagenal. The drawing is thought to be the work of John Thomas and is likely to have been based on direct observation of the battle rather than the traveller’s tales which many other platts of Ireland are based upon. The arms of Elizabeth I are shown in the top left corner and those of Lord Burghley, to whom the map is dedicated, are above the cartouche. The elaborate fish in the river are perhaps an attempt to show the fertile nature of the area. Beleeck is noted for its rich stocks of eel and salmon and this is perhaps reflected by the fish in the bottom left corner which holds an eel in its mouth.